YOU ALL ARE WONDERFUL! GROUP HUUUUUUG! For serious, though, you guys really cheered me up. And anyone can feel free to hi-jack this thread for their own use. Yes, I love that part too! I scored lower than Hitler on my final. Hahaha. My favorite is when he's yelling about how they should have gotten Zaitsev and Markovnikov when they were in Russia (but that's an o-chem inside joke), and when he's angry when he has lab during the review sessions. That suuucks. All rgitht--who else needs some positive energy?! I was late with hugs, but I join the congratulations! It feels so good to get rid of one of the finals, it does. Okay, I got the dates set up for my body scan. For the week of May 18-23, life is going to be crazy, and I won't know which way I'm going until it's all done. To put it simply, it'll be the usual marathon as I run to the lab to get bloodwork done, the doctor's office for the thyrogen shots, and the hospital to get a radioactive pill as well as the scan. But once it's all done, I have the reassurance that I have gone another year cancer free! I'll be sure to post the results once they're official. I know it's sort of silly to say, but GOOD LUCK! Or rather: I HOPE IT GOES WELL! I'm sure it will be fine! know it's sort of silly to say, but GOOD LUCK! Or rather: I HOPE IT GOES WELL! I'm sure it will be fine! Thanks for the well wishing. I'm sure it will all be fine, too, but it's always nice to know I have that support in the event of a catastrophe I never anticipated. I shall certainly keep you updated as things progress. The best would be if I could get the radiologist to spare a few minutes on the day of the scan to review the films after it's all done. For the last two years, I found out the results immediately because he was able to show me what he saw before the report came out. What kind of cancer did you have Mara? If you don't mind me asking. 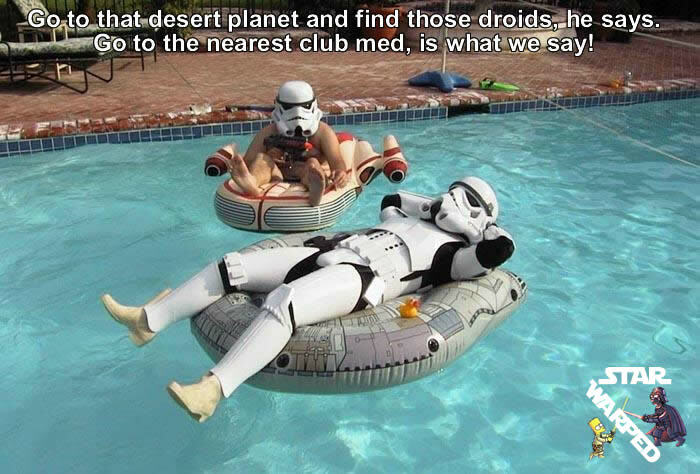 Oh, no problem asking! I freely speak about it to help others who may be in or know of someone who may be in a similar situation. I had to have my thyroid removed in 2001, but the cancer got in the lymph nodes of my neck so it took another two surgeries and a session of radiation treatment before it was gone. October 2003 was the last surgery, and in October 2008, I was officially considered in full remission. My doctor wants one last test on file, though, just for peace of mind. Traditionally, Thyroid Cancer strikes women in ther 50s, but men are known to develop it, too. The fact that I got it when I was around 25 years old continues to baffle the doctors. We can't trace how I developed it at such a young age. I wish the best of luck to you Mara! I'm sure you will be found healthy and continue to be. On a semi-related note, there is a board full of "Anonymous" posters that I tend to follow. 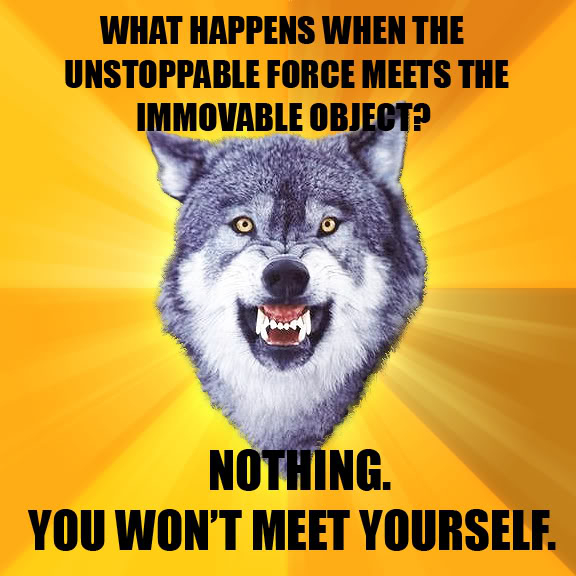 They have a set of very... motivating... images, known as "Encouragement Wolf" or, the more common known, COURAGE WOLF TIEM NAO. 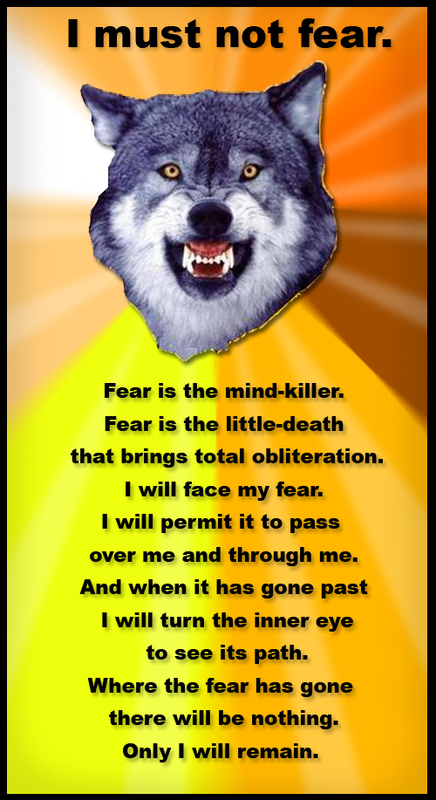 The trick is to look at the wolf, look at his face, and imagine it is him telling, yelling, shouting, shaking at you the motivating words. I've always had a fondness for wolves...I blame the TV show Due South and Diefenbaker (sp?) for that. Sorry for what appears to be a double post. I just got a horrible Mother's Day gift. It's 3:30 am, and our hot water heater leaked all over the place!! My husband is away this weekend, and I had to get a neighbor to help me shut off the water to the house. I called our electric/gas contract provider, and they're getting someone over here between 8 am-12 pm to look at it. My husband is now on his way back from his trip early...driving at 3:30 am instead of the 7:00 am he originally planned. I just paid all the bills and we're broke so if we need a new hot water heater, it's on the credit card for now until we get paid on Friday. Until we get this fixed, I have no way to use the water in my house now, either. We had to kill the water supply, too! Showers, potty breaks, dishes to wash, etc. all have to be done at the neighbors until this is fixed!! All I say is THANK GOODNESS I have a cat. He woke me from my sleep insisting that the dripping I heard was NOT rain (perfectly clear sky right now). Yay for Chewbacca. OH NO! That's terrible! Our hot water heater crapped out a while ago and it really sucked. I know how you feel. Hopefully someone can come and fix it and not replace the whole thing! Good luck! I hope your Mother's Day improves!! Thanks, Catika, but Mother's Day is a total loss. We're STILL waiting for the repair man. He never arrived at his scheduled time, and it's now around 3:30 pm at the time I write this. The good thing is my husband got home at 6:00 am, but there's really nothing he can do. Our hot water heater doesn't have a bypass valve (or whatever he called it) so our water is COMPLETELY shut off in our house because just having the water on in the house makes the hot water heater leak. I guess I'm packing up my shower supplies tonight and visiting one of my neighbors for a while. Good news: Hot Water Heater is installed. Bad news: The floor beneath is just about shot, and I'm waiting for the explosion as the water heater falls through the floor. *SIGH* That's the LAST time I pick a 4-leaf clover! I did that Saturday and had nothing but bad luck until I threw the thing back in the yard. Glad to hear your at least half way sorted out it could be worse you could have had these guys floating about. That's just great! Yeah, those guys would be LOT worse. They'd probably raid the last of my food supply while they're lurking about and chase the kids around until I pulled my hair out. *SIGH* Thanks, Jodo Kam, I needed that laugh. Okay, so I get the report from the doctor on June 2 for all the body scan testing. I think I can hold out another week. On another note: My company has just announced that they will be handing out layoffs tomorrow (Thurday, May 28). I'm hoping neither my husband nor I are on that list (we both work in the same company). Wish us luck, please! I can't afford either of us to be jobless right now. Even though, I put a quick contingency plan together, it's still a very scary situation. GOOD LUCK!! I hope you guys make it! My aunt is on the cutting block too at her company. Good luck with your aunt, too. I agree. Stupid economy. I heard it's supposed to be turning around soon, but not soon enough for too many I'm afraid. Good luck to everyone who's having employment concerns right now. I just crashed and burned on my line boat driver qualification test, so no raise for me until the company deigns to retest me. Luckily though, My job won't be going away anytime soon. Mara- Best of luck, ner vod. Hang tough, we mando'ade are made of beskar, one and all. And to think I fret about my finals... that's nothing, really. *gives Grit a hug* At least it wasn't something you'd lose your current job over, aye? Any income is better than none at this point, what with the economy and all. Just keep at it; I'm sure that if you keep up to the Mando standards you've put to yourself, someone is bound to notice your skills (and if nothing else, your gusto) and either approach you again, or put in a recommendation for you (however it is that your company works). Big hugs to you MMJ and I'm crossing my fingers for you in these dark, difficult times. I've meddled with job issues a lot and that could explain why I haven't been online much lately. The thing is that every year or so I tend to recreate myself and want to change careers. It may be due to the fact that I don't feel comfortable among the French people and I always see myself living somewhere else. People might say I'm "homesick" and detached from roots I had from three years living in the USA which makes me very frustrated to be stuck here. Vor'entye, Melyc'inya. Nothing like a little pep talk to get a guy off his shebs and back on the horse. Job-wise, we're safe and sound...Thank goodness!! They axed five employees, all in semi-high ranking positions and salaries. Thanks to everyone for your well wishing!! It was very appreciated! RC-2017: Sorry to hear about the bad news with the boating license. Here's a hug to you, too. Good luck with the endeavor. Chin up. I think Melyc'inya gave you the best advice, and I can't top that.